And free with a Pixel 2 phone. Google's most adorable product launch today is definitely its puck-size Home Mini. No more imposing cylinders with AI voices, it's much, much, smaller and just less "tech." At $49, it'll square up against Amazon's Dot, but like the Dot, it will act as a gateway smart speaker for those not willing to throw down bigger sums of money. 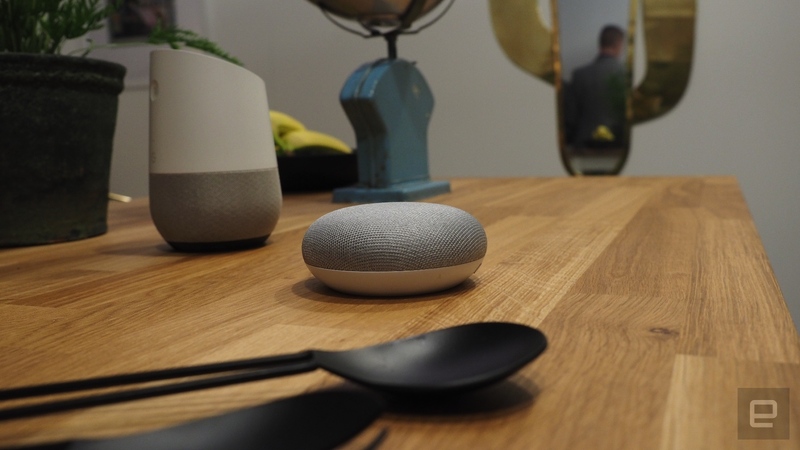 I took a look at the Home Mini at Google's satellite London event, and if other speakers left you cold, this unassuming AI speaker might win you over. Google's miniature version hones down last year's Home into a smaller design, but with all of the smarts. The only discernible drawback during my brief hands-on test was that sound was (understandably) less bassy and not quite as loud. I've owned a Google Home since it launched in the UK and never felt it was a replacement for my speaker system. As such, I don't really ever crank the volume to 11, and I'm betting most prospective Home Mini owners are likely to do the same. If the Dot is the Home Mini's biggest rival, then Google has Amazon beat on sound quality. That's not why you'd buy one, maybe, but you'd also be getting a connected smart speaker that can play Spotify, Google Music and plenty more services -- not to mention all the connected tricks it can do with smart TVs and your smart home. There's a lot to like about the design: I intentionally positioned the original Google Home alongside the Mini just to show how much smaller it is. It still looks like a Home device, but it already looks more like it'll fit into your home -- whichever room you decide to put it in. And at just under $50, it's in impulse buy territory. You might not have been interested in smart speakers until now, but if you got one free with your new phone, you'd try it out, right?